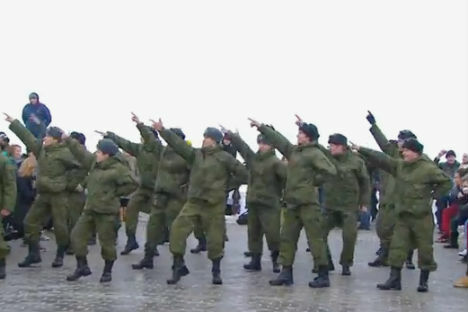 Is a video of a flashmob dancing on Vorobievy Hills directed at Vladimir Putin? Several days before the March 4 presidential election, a new video of a flashmob, “Puttin on the Ritz,” was uploaded to YouTube. It showed approximately 200 people dancing to the Irving Berlin tune on Moscow’s Sparrow Hills. The dancers included street cleaners and a troops of soldiers. There is no information about the creators of this video, nor about the organizers of the flash mob; the puttin2012 account from which the video was uploaded contains no other videos. The video has been viewed nearly 3 million times – perhaps a result of the similarity between the video’s name and the name of the winner of the presidential election. and what’s the last phrase? “I voted for Prokhorov but this action to support Putin is great! WELL DONE! GREAT!! :)"
Guys, it’s not in support of Putin, it’s AGAINST him! Of course they’re not singing about Putin but “putting” sounds just like “Putin,” so it sounds like it’s about him. The song is about snobby rich guys having a good time, “Dressed up like a million dollar trooper/Trying hard to look like Gary Cooper,” so this song has a deeper meaning. According to the ITAR-TASS news agency, “The huge positive charge and wonderful staging in the spirit of American musicals won’t leave any viewers unmoved.” Meanwhile, many online users see the “Puttin on the Ritz” video as part of Vladimir Putin’s election campaign, since it appeared just five days before the election. Seven years after the first flash mob in Russia, political parties and their leaders, especially during election campaigns, still actively use this means of self-advertising, which takes the form of popular social events. The United Russia party’s most popular flash mob took place on Sept. 1, 2011, when over 1,500 lessons were held in secondary schools across the country on the topic, “The Legacy of the 2014 Sochi Olympics.” The organizers described it as the biggest educational flash mob in Russia’s history. Russians are divided on the fate of the flash mob in its original form, some predicting it a success and others saying it’s has to decline and disappear. It’s clear that a classic flash mob is almost impossible: the type of event is too tempting for political and commercial organizations. Since the first commandment of a flash mobber – “an ideal flash mob needs no photo or video” – cannot work in that event.